• Indices provide a portfolio with lower volatility (i.e. risk) but with full exposure to relevant equity markets. • Minimum Variance portfolios use less risk budget available to investors. • Due to efficient portfolio construction no “overspending” of risk in relation to achievable return. • Shortcomings and structural performance deficits of market cap weighted indices are mitigated through alternative weighting mechanism. 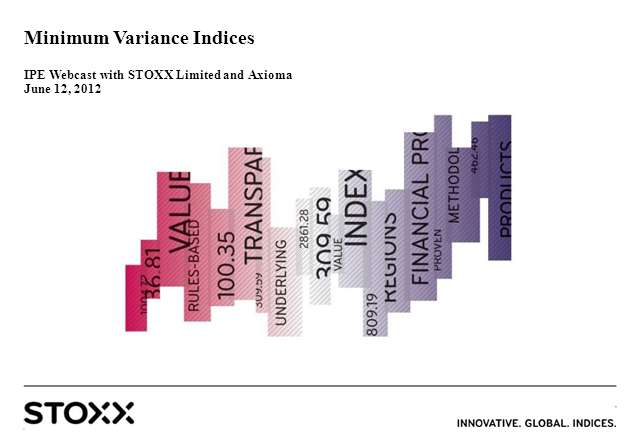 STOXX+ Minimum Variance Indices have been developed in collaboration with Axioma, a leading provider of portfolio constructions tools and risk models. Axioma provides the fundamental factor model used to calculate the rebalancing portfolios.